But no, she’s still there in the alternate dimension – and it’s now her birthday. Over to Jeremy and Elena – and Elena has also belatedly remembered Bonnie’s existence and wants to have a birthday party for her! Yes, she wants to have a party for the woman who is incapable of attending or even knowing one is happening. But Elena knows Bonnie would have wanted her to have a party without her. Jeremy points out how terrible this is. And they also talk about whether Jeremy can get into art school because he has talent but a terrible academic record; this actually implies Elena had a decent academic record to get into college despite never ever attending school. (Hey, these guys are talking about art school while a magically charged serial killer runs around, just reminding everyone. Oh, and Bonnie’s still stuck. Maybe we could free her rather than talk school?). Jeremy does remember Bonnie and says he doesn’t actually want to leave the area until they actually save her because she does actually matter and not just as an excuse to party. Of course, the word party has been uttered so Caroline is all over that. She does share a childhood story with Stefan (who is just there to keep their romantic tension at a permanent slow simmer; kind of like my nana’s vegetables that have been boiled for hours and hours and hours until every hint of flavour and nutrients have been ruthlessly annihilated) about how she once hid Bonnie’s teddy bear. She decides to go find it. They flirt over each other’s coping mechanisms. Which is kind of disturbing. In between Caroline digging random holes since she doesn’t actually know where she buried the bear, Stefan decides to taunt her in her pain because she needs to vent. Y’know not every emotional pain needs expressing through violent rage – maybe Caroline has her own way of dealing Stefan? Also, when Liz asked you to look after Caroline and help her move on, I think that was meant to be AFTER she died. They do find the bear and Caroline cries. Time for Elena and Damon to be romantic. And Kai drops in. I’m sorry why is this character not already dead by vampire? Anyway, he wants to give a letter to his sister Jo who he can’t find. He also tells them how his usual sociopath self seems to have developed some kind of conscience after absorbing Luke; he has guilt weasels and has no idea how to deal with it. Hilariously, he also points out Elena should look past his bad deeds because this is the Vampire Diaries and this is what they do (even mentioning Damon). Elena realises they can exchange services – and get Kai to bring Bonnie back. They decide they can use the weird broken Ascendant thing to send a message to Bonnie (now people are actually trying) and with that message they can help her find a big stash of magic with which she can get home – a lot of Qetsiyah’s blood in a gravestone. Jeremy arrives to doubt the whole change of heart but this would require actual reasoning and common sense and such things have no place on the Vampire Diaries. They use the spell and all go to haunt Bonnie. Literally since she can’t see them. This is not an entirely useful communication spell, it has to be said. They find Bonnie watching over the old footage of her and Damon together and Bonnie tapping into the oldest bottle of booze in the house; something she and Damon said they’d do when they could no longer stand being trapped and were considering suicide. Using some belated common sense, they realise that if they send just one person back rather than a whole crowd, they could have enough focus in them to do something useful and point Bonnie in the right direction. Elena gasps “no” – I know Elena, a good idea is completely anathema to your whole existence. Doing this may take more woo-woo than Kai has, resulting in him being squished (yay) and Jeremy also being stuck in Bonnie world (hey Jeremy, trading in all these folks for Bonnie is actually a bit of a win). In what could be a very touching scene, Damon declares he can’t watch this risky endeavour and goes to where the ancient suicide booze is stored. He and Bonnie made a pact to drink it together and he’s going to do it. This powerful, emotional and understated scene then has an Elena inserted to also drink the booze and make the whole scene about her and whether she likes bad guys because she’s a vampire. Really? Elena for one scene let it not be about you. Damon says that if she weren’t a vampire, she probably wouldn’t be with him. Anyway the spell is working, Jeremy sends the message – and Liv stabs Kai in the stomach which rather interrupts things. She begins magically killing him using all the lethal magic that, for some reason, not one single witch could muster before Kai killed Luke. He manages to stab her with a fork which apparently renders her unable to do more than yell “stop it Kai” when he throws flammable liquid on her. Kai prepares to burn her but new compassion-enabled Kai can’t do it. She stabs him again and Jeremy joins in the throwing of lethal cutlery and stabs Liv. Damon and Elena hear all this but someone has managed to magically lock them in their room, from a distance and without a ritual. Now that could have been impressively useful earlier in the series. Jeremy drags the bleeding, sweating and generally suffering Kai away and persuades him to send Jeremy back. There they find Bonnie drinking and crying with very sad music in the background. In rage and grief she goes into the garage and turns on the car – planning to suffocate herself. She records her last, tragic thoughts. But while recording it she remembers her grandmother’s words and tries to stop it – but this car has the worst CO2 standards in the world and the huge garage is already full of toxic fumes and she can’t get up. Jeremy manages to work the garage door. 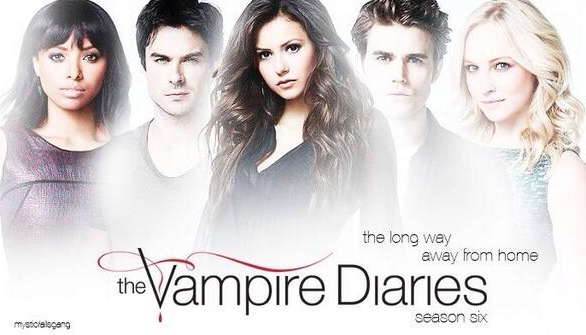 Back in the real world, the vampires ride to the rescue, Damon feeding Kai his blood and Elena… well Elena was there. All is saved – except Bonnie all alone – and they clear up the detritus of Bonnie’s party. Jeremy also has a sad moment reflecting that he’s also trapped (except not) and that he needs to move on (encouraged by Elena) and go to art school. On to Damon who snarks that Jeremy isn’t that good. Liv wakes up in her bed with Tyler being super-duper pissy – he dumps her for having an emotional reaction to her twin’s life. Elena, in a moment of stunning wisdom, declares that it doesn’t really matter what human Elena would have done. She isn’t and never will be human Elena again – who she is loves Damon. Over to the even more pointless characters now. Enzo is menacing Matt to make him help Enzo stalk Sarah Salvatore for reasons that make little sense but it’s a desperate attempt to keep these two characters relevant. Matt tries and fails to flirt with her and Enzo is duly scathing at his inability to seduce women. They remembered Bonnie existed! They finally tried to rescue Bonnie! Though even then it has to be said that they “tried” to rescue Bonnie because the opportunity to do so just fell into their laps. Also a large part of it seemed to be about Jeremy moving on and leaving the show rather than focusing on Bonnie. But hey, Bonnie exists and she’s finally on the path to escaping! Please make this happen at long damn last. Then have her leave the show and be part of a spin off with interesting characters. She could take… um… err… actually does Vampire Diaries even have interesting characters any more? As for Kai? Aaargh that was awful. Kai comes swanning into the room and Elena and Damon’s reaction isn’t “aaargh, super powerful serial killer” but more “ugh, you again”. Like he’s the guy who got messy drunk at the last party and vomited on the cat rather than an actual serial killer who killed someone just last episode. And Luke having no characterisation and just being killed off was offensive. No-one caring that Luke could be sacrificed was offensive. Luke dying and his death being used as a form of redemption for his murderer? Oooh well done Vampire Diaries you made this train wreck even worse. I don’t know whether to be amused or horrified that Vampire Diaries so completely recognises its own deeply broken morality that it is openly lampshading the ridiculous redemption of the evil characters. Why do Enzo and Matt even exist?